Triumph Over Adversity is an amazing document of a live performance at Brunel University from April 4th 1987, where the band was forced to play late as there was a bomb threat earlier in the evening. This live CD is superior in sound quality and features songs from all 3 of their studio albums. Triumph Over Adversity is explosive in performance and features the famous social-political lyrics the band was known for. This album features no overdubs or any mixing unlike most “live” albums. 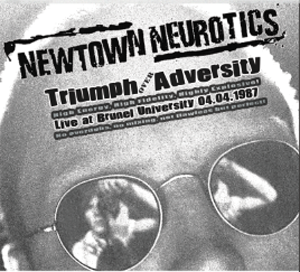 Triumph Over Adversity records the Newtown Neurotics at the peak of their popularity. This release is a great retrospect of the band and a great tribute to The Neurotics bassist Colin Dredd, who recently passed away April 25th 2015 after a long illness.